Along the Diquis River delta in Costa Rica, granite spheres have been found in the hundreds ranging from the size of a grapefruit to the size of a person. Theories have placed the spheres in a rather large date window ranging from 1,400 to 4,000 years ago. 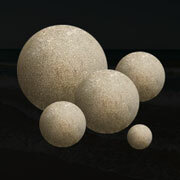 The majority of these perfectly shaped granite spheres weigh up to 16 tons with a diameter over two meters. No tools have been found near any of the spheres and science considers the ball creation is due to natural process. Calculations however, in some of the spheres, demonstrate a 0.2% error rate or less highly suggesting some sort of human intervention. Since the 1930's discovery in Costa Rica, world attention has helped to discover hundreds of other sphere formations around the world, many of which are thought to be carved. The spheres always tend to be nearly perfect, or as perfect as possible. There is a possibility tools have not been discovered, if made by men, because the smaller versions could easily be rolled around for some time. Given a chance if these giant stones were not carved by man, it certainly would be interesting to see or somehow replicate mother nature's process used to create them.